WHAT IS A FREIGHT BROKER? WHAT DO THEY DO? HOW CAN YOU BECOME ONE? A freight broker, also known as a “property” broker or a “truck” broker, is a third party intermediary between shippers and carriers. Brokers find shippers that have cargo to move; they then find carriers that are ready, willing and able to move that cargo. In the end, the freight broker derives a commission for his or her match-making skills. Smart truckers get their broker authority and go directly to shippers to get loads. Maybe they’ve been ripped-off too many times by other brokers and are left with nothing except their skivvies. Is there a solution? To become a freight broker, one must apply to the Federal Motor Carrier Safety Administration (FMCSA) to obtain their broker authority. There are no exams and there are no background checks. More recently, the FMCSA also requires a UCR registration. This is easy and inexpensive to get. You can expect to get started on your broker authority for as low as $1,400. In addition to the legal authority a broker needs to know, or get properly trained in, more than just the details of how to broker freight. They need to learn ALL the aspects of running a business including marketing, acquiring customers, cash management, planning, operations and perhaps personnel. After getting properly trained, finding good paying customers and reliable carriers are the FIRST items of importance in freight brokering. Customer acquisition is like any other service-oriented business. There are various traditional shipper directories. However, in the Atex training programs, we teach you to go where no one else is going. You DON’T want to follow the herd when looking for customers. By NOT following the herd, you will find receptive customers who are not being called on by a lot of other brokers. Plus the broker uses whatever marketing skills he or she possess. The Internet and telephone are probably the primary tools to conduct business with. 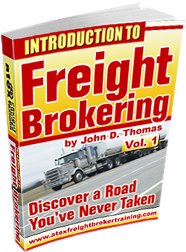 This, in a nutshell, is what a freight broker is, what they do and how to become one. Couple of final comments: 1) not ALL freight brokers are rip-offs. In fact, some come out of trucking and it would be like stabbing a brother in the back. 2) many truckers would like to get their broker authority but they don’t know where or how to start. I’ve been training for 15 years and have built a reputation for sticking with clients for as long as they need me.